No plan for this evening? 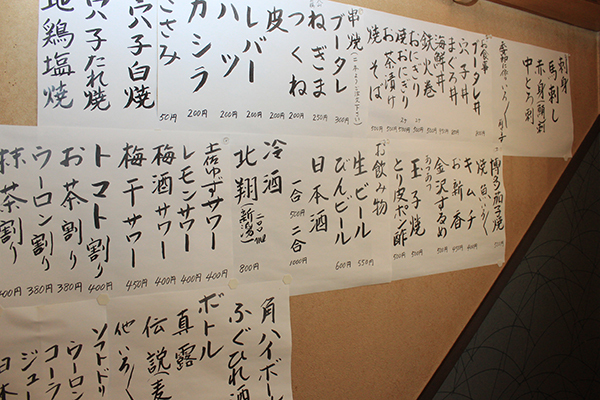 Why not go to Yuushoku Koizumi, a fun and friendly izakaya located in Kameido area? 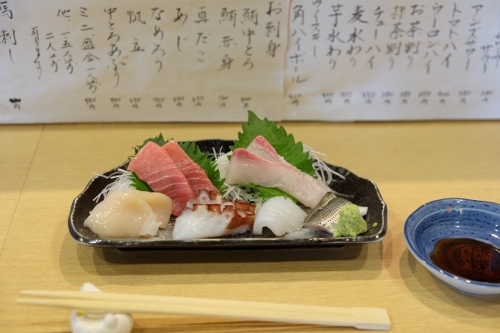 Dining at an izakaya is one of Japan’s quintessential experiences. Sitting at the counter or table, alone or with friends, enjoy a Japanese beer and taste the typical izakaya dishes. South of Kameido Station, Yuushoku Koizumi is located on a small and quiet street. The modern frontage of the restaurant contrasts with the old-fashioned, and charming inside. 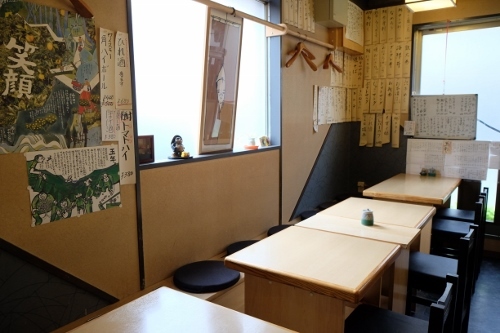 The interior features a counter in a comfortable atmosphere, and Mr. Koizumi, the owner, stands behind. Mr. Koizumi first worked in restaurants in Ginza and Toranomon, in Kyushu (located southwest of the main island Honshu). 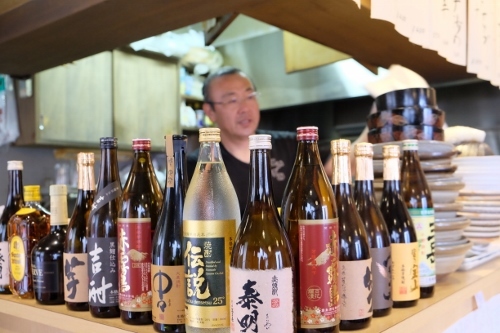 He then opened his restaurant, Yuushoku Koizumi, in Kameido 20 years ago. Yuushoku Koizumi is a family-run restaurant. The wife of Mr. Koizumi and his mother-in-law, Mrs. Tomoko, work with him. 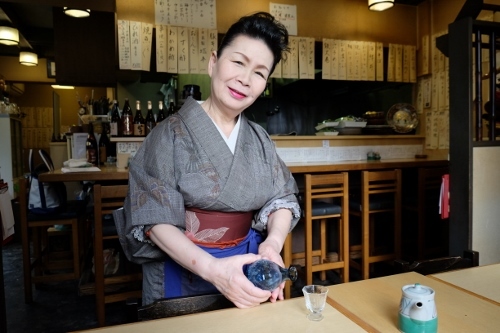 Mrs. Tomoko used to run her own izakaya in Kameido. She always wears the traditional Japanese kimono and is beautiful! 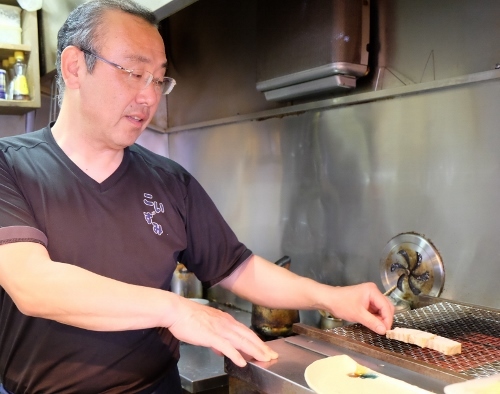 Unlike other restaurants, meals are cooked at the last minute at Yuushoku Koizumi. Mr. Koizumi uses fresh ingredients and guarantees high-quality dishes. It is worth sitting at the counter to watch Mr. Koizumi preparing the food. 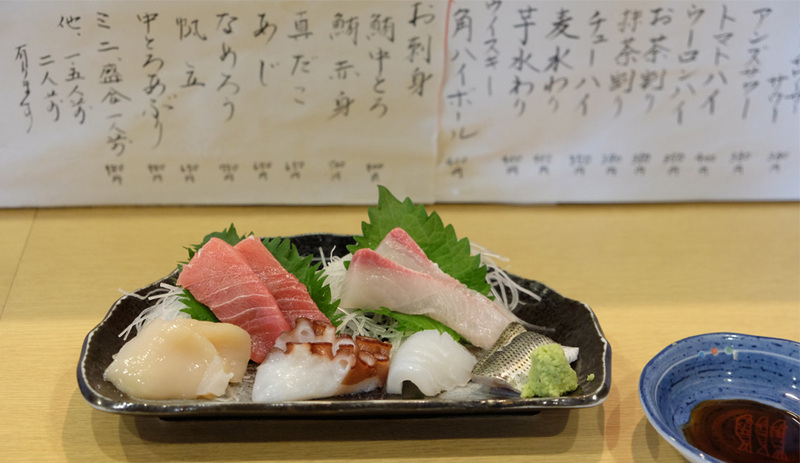 Even if the menu is written in Japanese, don’t hesitate to ask Mr. Koizumi for his recommended dish, by saying “osusume.” The chef’s specialty is sashimi. 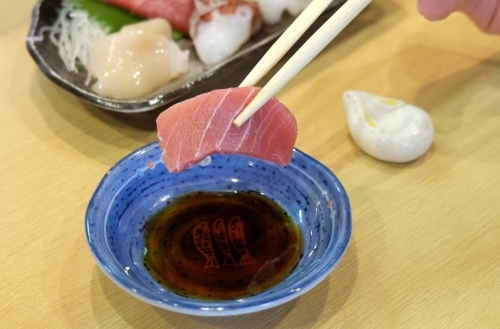 Tuna sashimi is on the menu throughout the year and if you dislike some fish or seafood, Mr. Koizumi can adapt the ingredients to your taste. Don’t miss trying the pork skewers called “butare”, slow cooked pork belly. 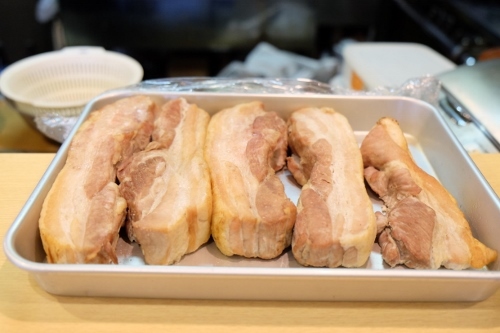 Mr. Koizumi first grills the pork for a few minutes, simmers it for 2 hours, and then lets it rest. 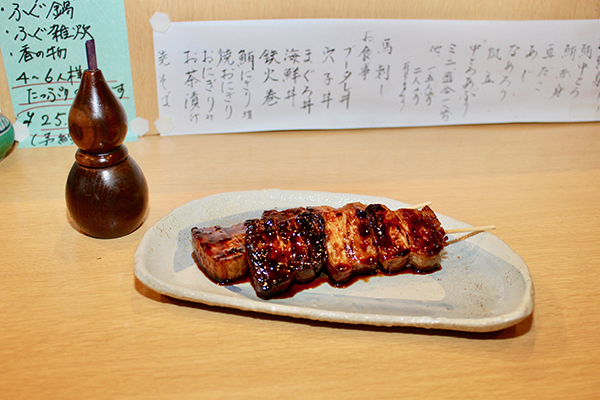 Then, he grills the skewers on the barbecue and serves them coated with a sauce made of soy sauce and sugar. Delicious! “Spices may be added to balance out the dish,” said Mr. Koizumi. In the small wood container, you’ll find “shichimi,” the most famous Japanese spice mixture containing seven ingredients. When you look at the wide variety on the menu, it’s an excellent opportunity to taste new and original dishes! 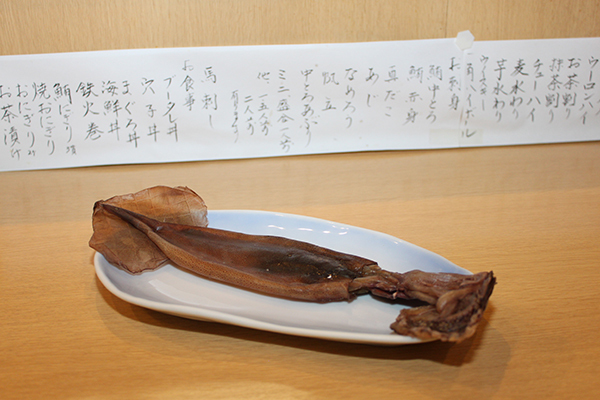 Another original dish that you can taste at Yuushoku Koizumi is the stuffed Kanazawa dry squid. 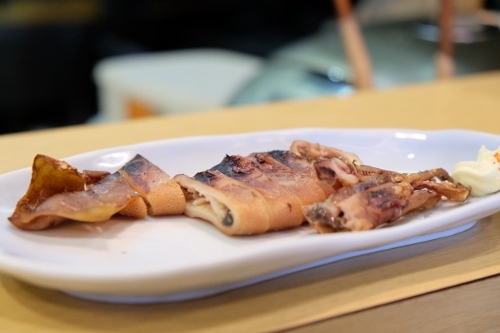 A great way to enlarge your culinary horizons and to try izakaya cuisine! 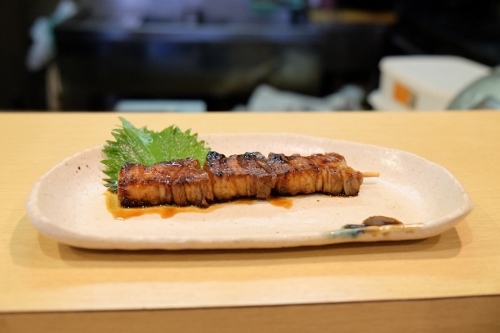 At Yuushoku Koizumi, you’ll taste a traditional and delicious izakaya cuisine in a typical Japanese ambiance. There, you can have an authentic experience! Bon appétit!